Simple to use. This machine tube cores and peels pineapples—there is no slice left in the ring. 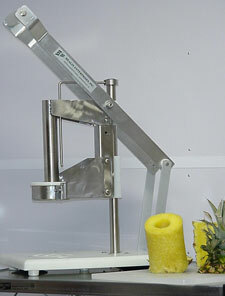 Just cut off both ends of the pineapple by hand, or with our manual Pineapple Top & Tailer (Pneumatic Top & Tailer also available), place it on the center of the base and pul the handle down. The pineapple is tube cored and peeled at the same time, giving you a perfectly peeled pineapple. Made of stainless steel construction, with heavy duty aluminum handle and HDPE plastics (grip, base, slide, blocks). All parts are replaceable. Four (4) replaceable solid rubber suction cups keep the machine secure while tube coring and peeling. Different sized cutting assemblies and available (84mm, 96mm (standard), 108mm and 122mm. 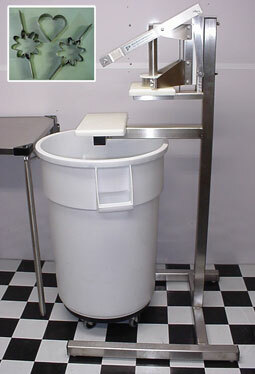 This machine has a foot print of 10" x 15" and is 19.5" tall, with an operating area of 20.5" front to back.